I remember when I was a child, from five to nine, walking into Notre Dame while holding the hand of Esther, my Mexican nanny at the time – a devout, black-haired Catholic lady who would tuck me into bed every night by having me recite the “Padre Nuestro” (“Our Father”) prayer out-loud. She took me to Notre Dame regularly. Inside the Cathedral, where silence enveloped the air that was cooled by old stone walls imprinted with history, I would bend my neck all the way backwards and look up to the to tall ceilings of the edifice. Esther would sit on a pew, fold her hands, close her eyes, and pray. I would do the same. For decades to follow, even after having embraced Gaudiya Vaishnavism, whenever I visited Paris I would eagerly visit Notre Dame. I cannot count how many rounds of japa I have chanted inside the shelter of Notre Dame, hearing my the sound of my footsteps on the floor, walking by confession booths and feeling inspired by the dedication and devotion of millions of pilgrims and devoted souls who had sung, heard and prayed there before me for 800 years. So when I recently watched the online footage of Notre Dame burning down, and when I heard from newscasters that the Parisian firefighters may not be able to even salvage the core structure of this Western symbol of monotheistic devotion, my heart squirmed and tears rolled down my eyes. Notre Dame is dear to hundreds of millions of Christians and non-Christians world-wide. Notre Dame is also dear to many ISKCON members, who have either visited the Cathedral or/or who admire Christian devotion. Scripturally-speaking, what can we glean from the terrible incident that nearly burned down Notre Dame to ashes a few days ago? The ontology of matter is impermanence; nothing lasts in this world. A material body may be 100% engaged in Krishna’s service, and a wondrous religious edifice like Notre Dame may be similarly built and used in Krishna’s service. But all material bodies and all churches, temples, and synagogues will sooner or later vanish. This fact may alleviate pain that we may feel in such instances as now. For seconds, we can remember – and observe – that devotion to God (or Krishna), is invincible. Indeed, while our physical bodies slowly decay and eventually die, and as any religious building also inevitably vanishes sooner or later, the bhakti of the devoted soul lasts forever. Krishna reminds us that the soul can never be cut into pieces, nor can it be burned by fire, nor moistened by water, nor withered by the wind (BG 2.23). Similarly, the love of the devoted soul for God (and God’s love for the soul) transcends temporary matter. We witnessed this claim online on the evening of the tragedy in central Paris, when a group of loyal Catholics were filmed singing hymns to God in unison, a few hundred meters away from Notre Dame. 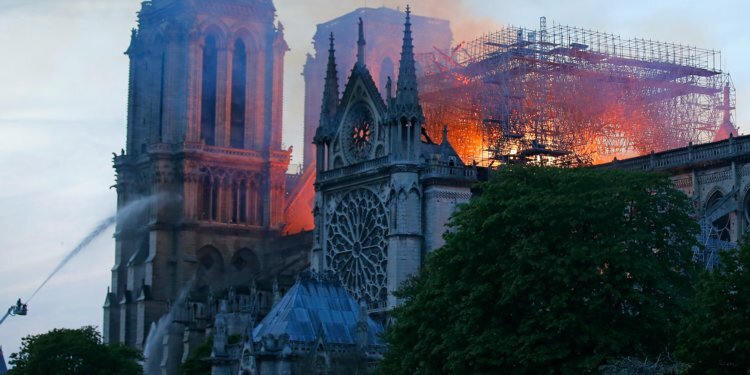 As the flames in the Cathedral were visibly raging in front of their tear-filled eyes, these Catholic men and women sang their hearts out, a capella, showing the world that while Notre Dame may burn down, their bhakti would continue unabated, or even strengthened. Nothing happens without the sanction of Krishna, we believe. Therefore while we can (and perhaps should) mourn the destruction of Notre Dame, we can remind ourselves that Krishna, or God, must have a plan here. Perhaps this tragedy serves as an impetus – as we witnessed with this group of Catholic singers that I just described above – for devoted souls to take all the more shelter of the Holy Name. The burning of Notre Dame, which can be considered to be inauspicious, reminds us that Lord Caitanya made His appearance in this world during a lunar eclipse – a time that Hindus also consider to be inauspicious. And yet the all-powerful Lord Caitanya chose this inauspicious moment for His appearance. Why? To induce everyone to take shelter of the Holy Name. As the Caitanya Caritamrita describes, everyone in Navadvipa was chanting the Holy Name when the Lord appeared. He did this on purpose, simply to make people chant Hare Krishna. Similarly, the fire of Notre Dame – and the singing of these devout Catholics meters away from the fire of their beloved church, can remind us of the importance of the Yuga-dharma. We may add that Lord Caitanya never established any temples. The Lord performed puja of His personal deities, in His home, as a vaishnava householder. And He certainly took loving darshan of Lord Jagannatha in Puri as well as of many other deities of the Lord in numerous temples across India. But the fact remains that He did not spend any time establishing temples. Why? Because He instead established – by His example, the prime importance of performing the Yuga-dharma: chanting Krishna’s names. Your local ISKCON temple will not last the test of time. Your physical body will grow old and die. But be assured that you, as a soul, will live on, and that your relationship with Krishna transcends temporary matter. 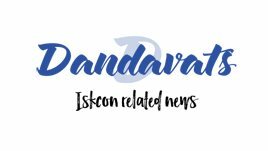 This is not to say that we, as members of ISKCON, should be indifferent to temple constructions or feel no affection for already existing places of monotheistic worship (within or without our tradition). For example, we should be delighted that the Temple of the Vedic Planetarium in Mayapur Dhama will soon be opened and will spread the glories of Lord Caitanya all over the planet. At the same time, Lord Caitanya’s not establishing any temple Himself, and the burning of Notre Dame Cathedral, can remind us that no physical body – and no religious building in this world will ever last forever, and that the chanting of the Holy Name of God constitutes the condensed essence of spirituality in this Age of Kali. Thank you very much for this comforting article. Although I left France 49 years ago, when I heard about the burning of Notre Dame, tears also came to my eyes. I did return to France in 1982 as an ISKCON devotee and spent ten days there. And during that time, one devotee took a few of us to Notre Dame to show us an amazing sight in one of the side chapels on the left side of the cathedral: a "diorama" kind of scene, carved in marble, showing Jesus, with flowing robes and flowing hair, sitting on a bench, talking to a group of small children. And one of the children has a shaved head and a sikha. Hare Krishna! I hope the fire didn't damage it.